DuraVision allows you to view difficult to see areas through an extensive range of acrylic, polycarbonate and stainless steel mirrors. They are impact and UV resistant, and the advanced mirror and shaping techniques we use ensure a reflection that gives clear, undistorted images. DuraVision mirrors range from domes to convex wall or post-mounted styles and are ideal to monitor a difficult or hazardous area, allow safe movement of people or product around sites and provide extra visibility in difficult to see areas. 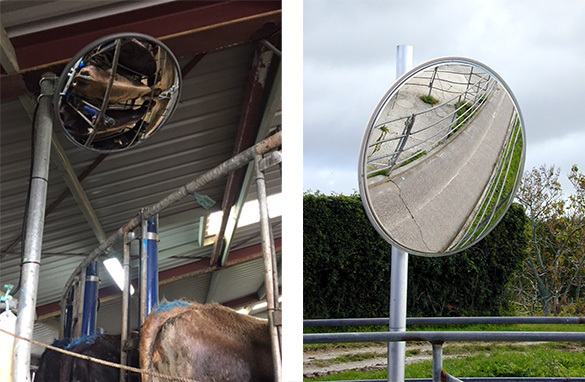 DuraVision’s range of impact resistant acrylic and highly polished stainless steel convex mirrors can significantly improve livestock observation and assist with heat detection. Mounting a Heavy Duty acrylic or stainless steel mirror above livestock (eg: during milking) can make it easier for a farmer to view the Tail Paint or Heat Mount Detectors on the livestock's backbone and tail area. A long handle Inspection mirror can also be used for heat detection when a farmer requires a mirror which is more portable. 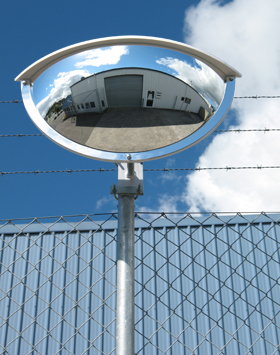 Made in New Zealand and designed for tough outdoor conditions, DuraVision’s range of convex mirrors can be positioned to ensure a clear undistorted view, especially to check for animals in the yard and backing gate placement. These convex mirrors come complete with fully adjustable brackets and are built to last. Click HERE to download Installation Guides on our full range of DuraVision Convex Mirrors.